Few poets aim to be considered “global.” They are generally endeavoring for universality instead, the tone or rhythm or metaphor that stays with the reader, any reader—that’s why so many poems talk about love. Among Tsang’s themes in this book is love’s transitional strangeness, a love for places and stories, for images culled from fairytales, art, and music. Romantic love, as Tsang describes it, is a thing that “changes once/you come down/from the mountain.” There are poems here that evoke youthful romance: early “indiscretion” of which the “luxury [is] being cheap/but not thrifty,” and headlong love “disguised by the curse of your desire,” and lost love and mother love and love of the arts. Then there is the risk any writer takes when drawing inspiration, imagery or metaphor from fairytale texts—the risk of cliché. Phoebe Tsang’s re-imaginings of folk and fairy tales generally work because in most of these poems her fluid, simple language does not become stilted or over-familiar. The most memorable poems in this collection, however, are not the revisited fairytales (with the exception of the enchanting prose poem “The Fox and the Lady”) but the pieces that allude to such inspirations without making them foremost in the reader’s mind. After the opening stanza with its Andersen allusion, Tsang gives us “real” place (the house with the squirrel problem) containing drawers full of real sweaters that, in the fourth stanza, begin to sneak out and to “shake loose stitches like worsted/strands of Rapunzel’s tresses.” In the next section, the poem’s speaker watches spiders on the ceiling, listens to construction workers hammering. The poem is not a fairytale retold and needs not clarify the answer of “where”; the princess merely felt something and awakened, like the narrator. Now, the speaker finds herself in an ambiguous waiting zone—the place between awake and asleep, dream and reality, where everything is unfinished and where we are not assured of a happy ending. Famous princesses become allusions, not origins. The approach works. 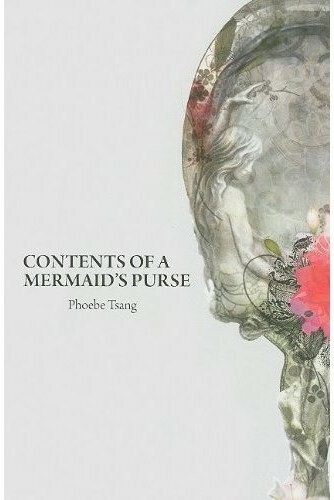 With the publication of Contents of a Mermaid’s Purse, Phoebe Tsang grabs the reader’s hand to show how classic motifs can dwell in globalized, 21st-century literature.